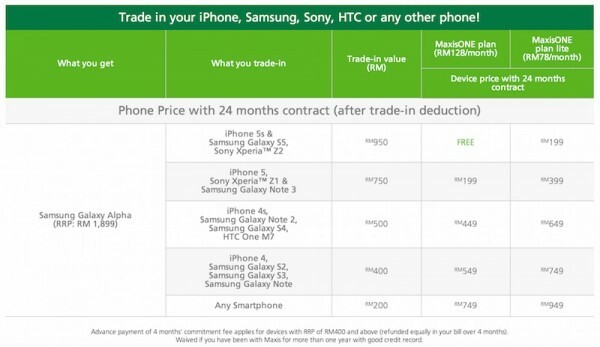 Maxis has just revised its trade-in offer, allowing you to get the Samsung Galaxy Alpha at a subsidised price, and save up to RM950 extra when you trade in your old phone with the telco. Like the trade-in offer for Sony Xperia Z3 that was announced last month, you can get a minimum trade-in value of RM200 but if you have one of the listed devices, it can go up to RM950. Maxis accepts any phones, but if you have an iPhone 5s, Samsung Galaxy S5 or Sony Xperia Z2, Maxis will offer you RM950 as a trade-in value. If you have an iPhone 5, Sony Xperia Z1 or Samsung Galaxy Note 3, you can save up to RM750. Maxis also accepts the iPhone 4, iPhone 4s, Samsung Galaxy Note 2/Note, Galaxy S4/S3/S2, HTC One (M7). Older phones are also accepted and are guaranteed a minimum trade in value of RM200. The device price shown is after telco subsidy when you sign up for a MaxisONE plan lite or MaxisONE Plan postpaid plan under a 24 months contract. As always, Maxis’ trade-in offer does not require any charger or box for your old device, but you must make sure that the screen and case are not broken, and everything is working well. Visit Maxis for more information about their trade-in offer.